New York City’s medical examiner has ruled that the Connecticut woman who died after falling down the stairs in a Midtown subway station while carrying her child’s stroller likely had an existing medical condition. Goodson, 22, died after falling Monday evening at the Seventh Avenue subway station in Manhattan. The infant daughter she was carrying was found conscious by first responders, and was ultimately uninjured. While the medical examiner did not reveal the nature of Goodson’s condition, her family said she’d previously suffered from a thyroid issue and had complained of headaches the day before. 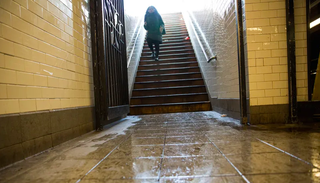 Goodson’s death has reopened a larger conversation about the inaccessibility of New York City’s subways; of it’s 472 stations, only around a quarter are available to those unable to use stairs or escalators.